Nave's Topical Bible was originally produced by Orville J. Nave, A.M., D.D., LL.D. (1841-1917) while serving as a Chaplain in the United States Army. He referred to this work as "the result of fourteen years of delightful and untiring study of the Word of God." Nave's topics were originally published in the early 1900's. ⇒This book is still in print and can be ordered here. This is an online version of the complete text of Nave's Topical Bible, a type of Bible concordance with over 20,000 topics and subtopics, referencing over 100,000 Bible verses. The text is indexed by Nave's 5000+ main topic headings. 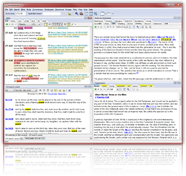 To make web-based use easier and study faster, verse references are fully quoted in-line using the King James Bible, up to about 100 complete verse quotes (with the remaining left as references). "The object of this book is to bring together in cyclopedic form and under familiar headings all that the Bible contains on particular subjects. The subjects formulated are of practical value to every profession and to all who desire to consult the Bible." —Orville J. Nave, 1905.